The Council Negeri meeting in Kuching, Sarawak on Malaysia Day 1963. # SUPP condemned the Malaysia proposal as unacceptable to the peoples of Sarawak. # On 4th September, the newly elected Council Negeri, sitting for the first time, passed a resolution welcoming the establishment of the Federation of Malaysia by 31 votes to 5, all the five 'no' votes came from SUPP. # The Malaysia Agreement cannot be changed through constitution because this agreement was signed among sovereignties. The Malaysia Agreement was signed on 9th July,1963 by Britain, Malaya, Singapore, Sarawak and Sabah in London. # The Malaysia Agreement stated that Malaysia would be proclaimed on 31st August 1963. However, due to the turn of events i.e. the Presidents of Indonesia and Philippines wanted if truly the peoples of Sarawak endorse the Malaysia Plan and wanted the 1962 and 1963 Elections to be verified. Thus the UN sent a mission. This delayed the launching of Malaysia till 16 September, 1963. # Even Malaya was itself only partly independent in that it relied on Britain for its defense. # Although British officials still remain in administrative capacities in Sarawak and Sabah, they did so at the behest of elected governments. # One of the reasons that the British government pushed for more self-rule in the last days of colonialism in Sarawak was that they feel unwelcomed by the anti-cessionist movement. Thus this fact points at the role played by the anti-cessionists in bringing about the formation of Malaysia. # The process of decolonisation saw the leaders of the colonial states of North Borneo (Sabah) and Sarawak to seek ways to achieve independence. 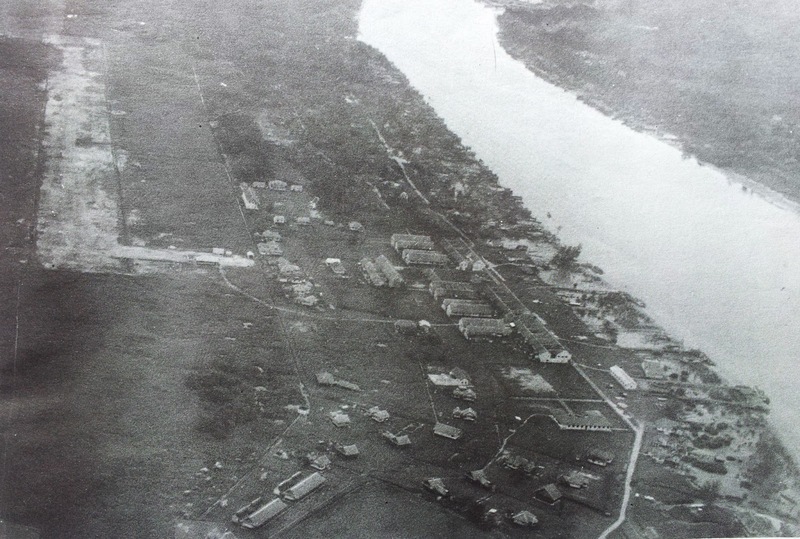 The British appointed Malcolm Mac Donald as High Commissioner to the territories implied that British policy was to coordinate and push for the merger development in Malaya, Singapore, and the three Borneo territories. # The Cobbold Commission can be said to have functioned as an important "cover" to legitimate the British decision to withdraw from Sarawak without having first granted self-government, as promised at the time of Cession. # It would be more appropriate to presume that the British plan for the disposal of the colonies was in accordance to their grand plan. They suggested, and the Tunku concurred. Patriotic songs and flags waving on the main stage during the Malaysia Day celebration (National level) held in Bintulu at the Old Airport site. on 16th September,2016. In Kuching last August I had a little window of opportunity to pay another visit to Serikin where the "Little Indonesia" is. We took to the road on a Friday morning to visit the little border town of Serikin. It is about less than an hour drive from Kuching city center. The road to Serikin is all paved and is very safe to travel even alone in your own car. Serikin is where Indonesians bring and trade their goods to Malaysian tourists and visitors. It would take about a day or less for Indonesians to travel by road to Serikin which sits on the Malaysian side of the Indonesian-Malaysian boundary line. Here trade in Indonesian made products are brisk and keep on expanding yearly. It seems to me that the place thrives due to private sector dynamism. Indonesians provide the goods that are produced at relatively cheap cost and sold to Malaysians in Malaysian currency. Transaction-wise, Malaysians are bound to benefit due to the high value of the ringgit ( Malaysian currency) vis-a -vis the Indonesian rupiah. At the same time Indonesians find a captive market for their products. But the attraction of Serikin lies also in its ample and wide range of products from household items, personal attire and accessories, food, furniture, handicrafts and souvenirs, herbal medicines, toys, etc. Today the sun was pouring its heat and the tiny road that tugs the stall on both sides were shied-away by visitors as they preferred to walk under the sheltered canopy of the stalls. Despite the heat I thronged together with hundreds of other eager Malaysians to savour a little of Indonesia. This place has turned out to be a well-patronised "Little Indonesia" on Malaysian soil. You can be spoilt for choices of rattan mats. 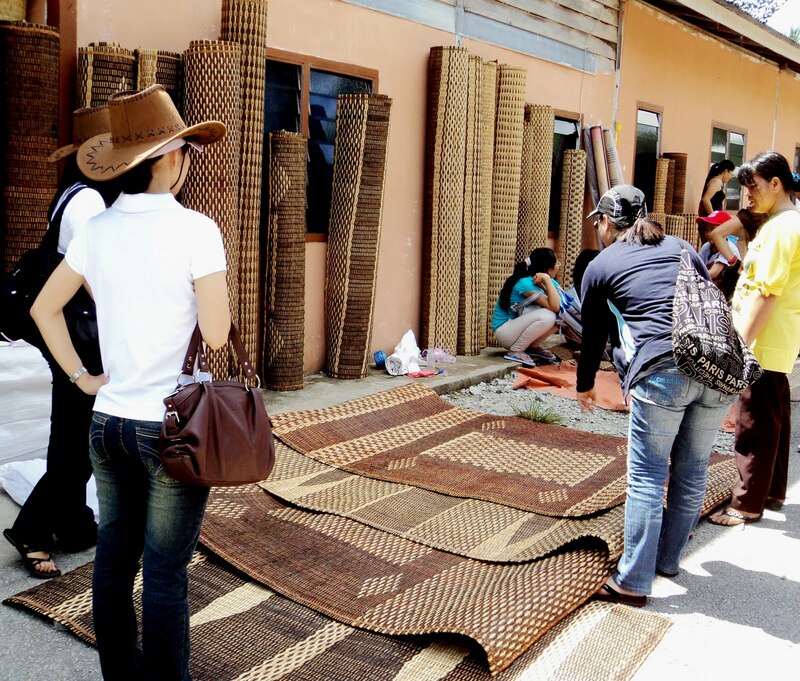 The rattan business is the main attraction at Serikin. In our local Malaysian culture especially among the natives, rattan is very much ingrained into their daily lifestyles. Rattans are used for ties or fasteners for scaffolding and timber building construction, strings for various purposes e.g. rafts, carrying baskets for industrial, domestic and personal uses, cultural artifacts, furniture, handicraft or souvenir items e.g. bangles, handbags, food covers, mats, chairs, fish traps,etc. Such is the versatility, robustness, and usefulness of this climbing palm species from the jungles of Kalimantan (Indonesia) and also Sarawak. You can be spoilt for choices. Rattan mats of varying sizes, patterns and material mixes ( e.g. rattan plus tree bark) catches up with Malaysian tastes and fads. The prevalence of these mats indicate the richness and sustainability of the rattan plants in Indonesia while in Malaysia these plants are a declining and dying species in large part due to conversion of virgin forests to oil palm plantations and acacia plantations for the production of pulp especially in Bintulu area. A female supplier for rattan mats downloading her motorcycle fully loaded with folded rattan mats. I tried some free samples of chips ( see inset) before I decided to take home a packet of spicy tapioca chips . 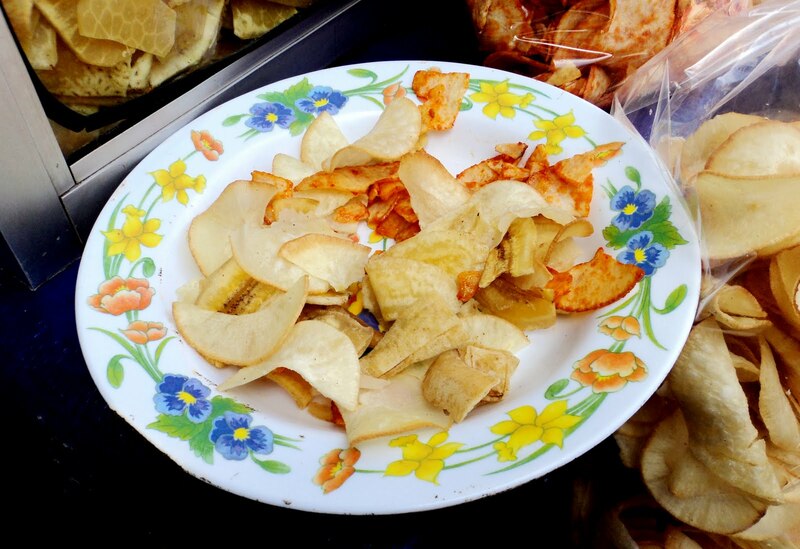 On the plate were chips from the breadfruit, yam, banana and tapioca. They were all very crispy, tasty ,fried and without any preservatives. In Malaysia now there is a growing interest in the processing of chips as a cottage industry because the rural entrepreneurs produce the basic material plus many of them enjoy some micro -credit assistance from banks and other financing institutions. Many of them are eyeing the export of chips to overseas countries especially Arab nations where consumers are concerned with 'halal' food products and Malaysia is only one of the few Islamic countries that is pursuing 'halal' manufacturing hubs on a global scale. However, for export purposes the products are rigorously manufactured and packaged to meet international standards of quality, safety and longer shelf-life. The wordings in Indonesian Malay indicate the type of chips available. 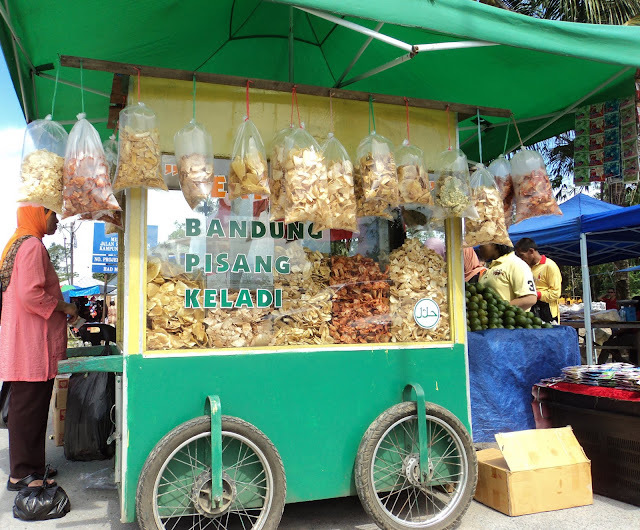 "Bandung" is tapioca, "Pisang" means banana and "Keladi" is for yam. A packet above costs RM 5 . Needless to say, today was another fun outing to a gradually popular destination for visitors to Kuching city called "Little Indonesia", but sitting squarely on Malaysian soil. A coastal launch typical of the 60's is seen entering the Miri river mouth. Picture credit: Ho Ah Chon, "Sarawak in pictures - 1940's - 70's". 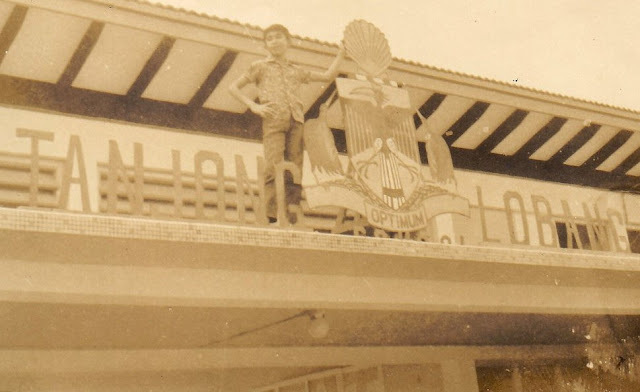 Me standing next to the school emblem in 1967. The school's motto was 'Optimum'. I have very fond memories of my student days at Tanjong Lobang School in Miri of the 60's. Coming from a remote fishing village town of Bintulu, some 200 kilometers away from Miri,was something to be lauded about because as prospective students we were firstly selected to study at that premier institution of learning. Most of the students were picked from the central and northern areas of Sarawak. I studied there starting in 1967 when it was still called 'Tanjong Lobang School', but later changed to 'college' after the government of the day decided to accept only students studying for Form Four till Upper Six to fill the classes there. Travelling to Miri when the school term begins and back to my hometown for the term holidays would entail travelling by sea. In those days, travel by sea evoked mixed feelings of adventure,fear, mission, sea sickness and sacrifice. I had to endure these experiences for four years to get the best education available during those times which money cannot buy. The journey meant a full day and night in small coastal launch in heavy seas or moderate waves. In daylight we could see the endless green coast and sandy beaches, felt the salty sprays brushing our young faces and watched the waves ahead and past us. In reflection we were indeed fortunate to have survived the ordeal at sea because in the 60's we had little choice in travelling to school since road travel from Bintulu to Miri was non-existent and air travel was too expensive and largely beyond the means of most parents. My travelling journey at sea to begin the school term or back for holidays would not have happened safely if not for the expertise of the ship's captain. I now feel greatly indebted to those unsung heroes.